Reviews can sometimes take a little longer than we’d like to hit our front page. Usually it’s because it took a little while for the gear to hit the mailroom. Then again, sometimes we wanted to spend a little extra time with it or had questions about it. In other cases, it may just be that we are training for an A race and want to stick with our planned race equipment. And unfortunately there is the case of the perfect storm – where a single article is held up for every single reason listed above. Luckily all storms eventually run their course, and with that, we are finally ready to share our thoughts on one of our favorite bikes in transition today – the Scott Plasma 5. It was almost exactly three years ago that we first shared the Plasma 5 on our pages. 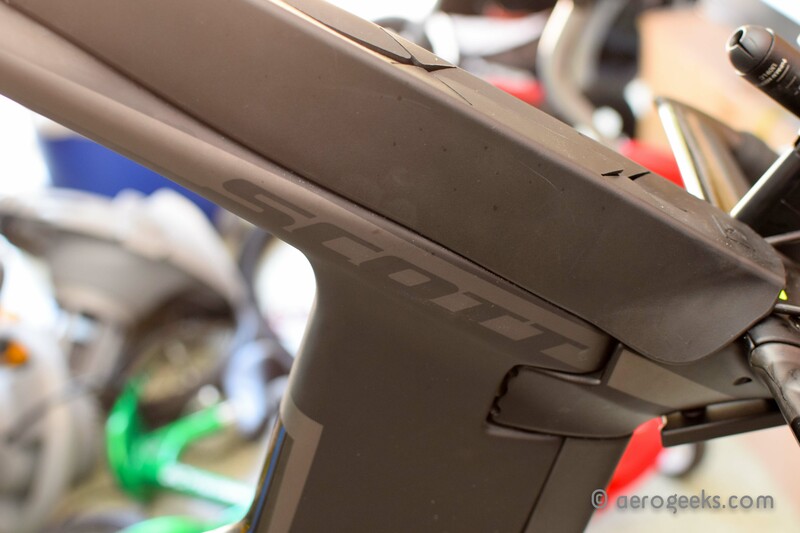 We then got a chance to check out the full galleries Scott sent to us and even spent a little time on it at Interbike. But none of that was enough for us. So Scott sent us a frame kit to build up a little over a year ago. Unfortunately, that timed out with us prepping for a 56-mile time trial. That meant we were putting in a lot of time on our race bike, and not very much on our test bikes. It wasn’t until this past fall that we were able to start putting the miles on – and what miles they were! But before we dive into our thoughts, lets recap what Scott put into the Plasma 5. When you first look at the Plasma 5, you start at the front. That’s where Profile Design has helped craft a fully integrated hydration solution. 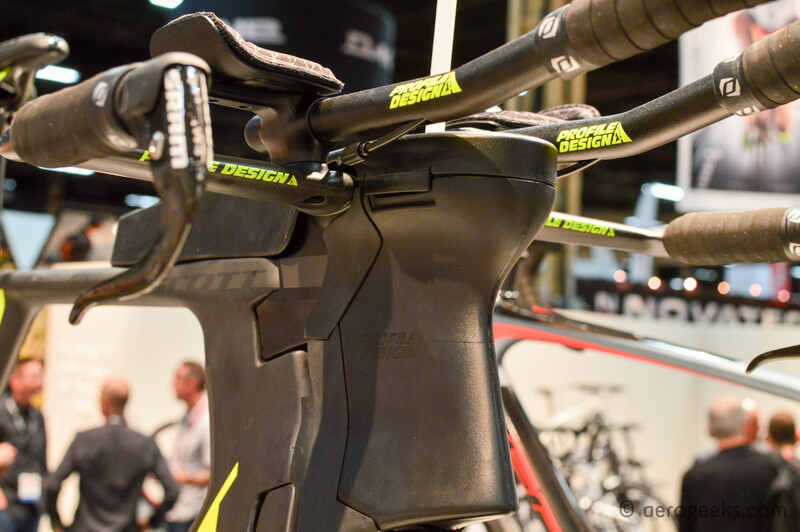 Located in front of the head tube you find the Plasma 5 Aero Drink vertical hydration. Sized to match the frame (550ml\625ml), the bottles are easily removable. 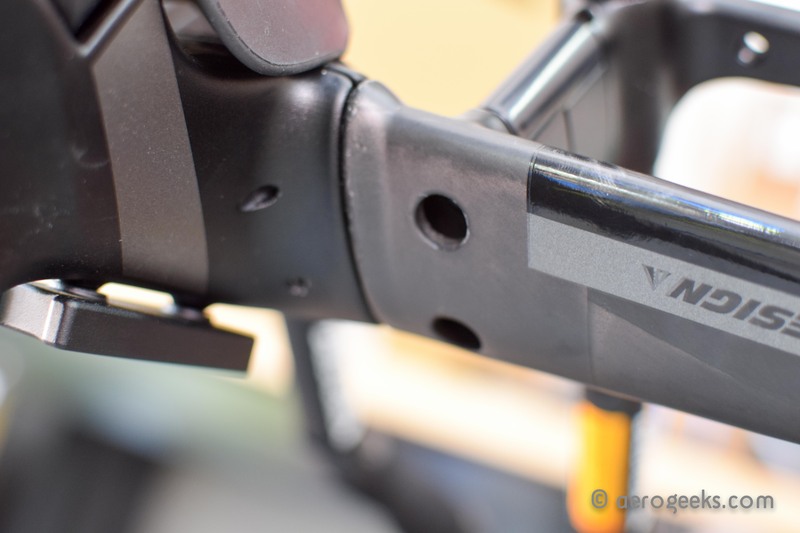 The clip-on connection ensures a firm linkage to the stem and a secondary connection (via a soft interface) to the front brake cover. The soft interface helps to avoid vibrations. The bottles themselves are dishwasher safe. A storage box resides on the top tube. The box features a two-cell design, which allows for the separation of fuels (or a convenient space to throw your trash). The cells are created via a removable divider, allowing you to modify the space as needed. With the divider removed, the box can hold a good amount—up to eight energy bars. Designed with a solid body and a rubber top, the box is connected via a standard 64mm bolt interface that can be replaced with a standard bottle cage. 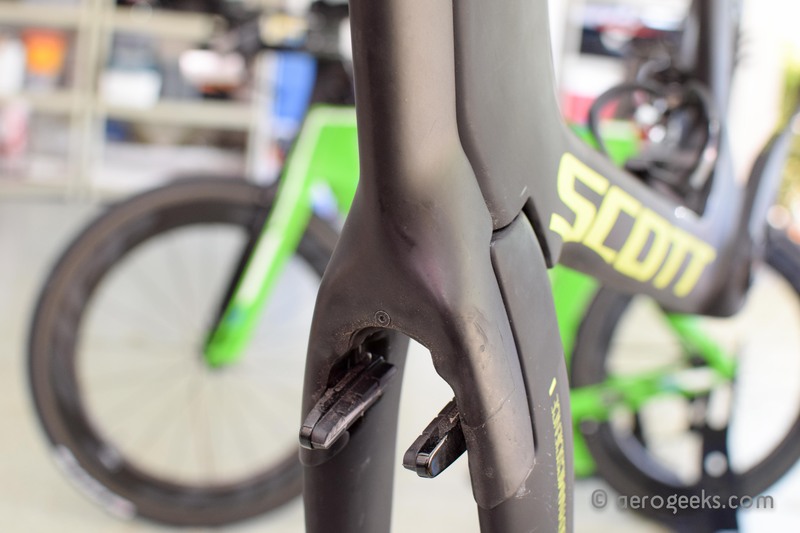 Scott built the Plasma 5 to accommodate the needs of both the TT rider and the triathlete, and to honor that mission, has crafted two stem options – Tri and TT. 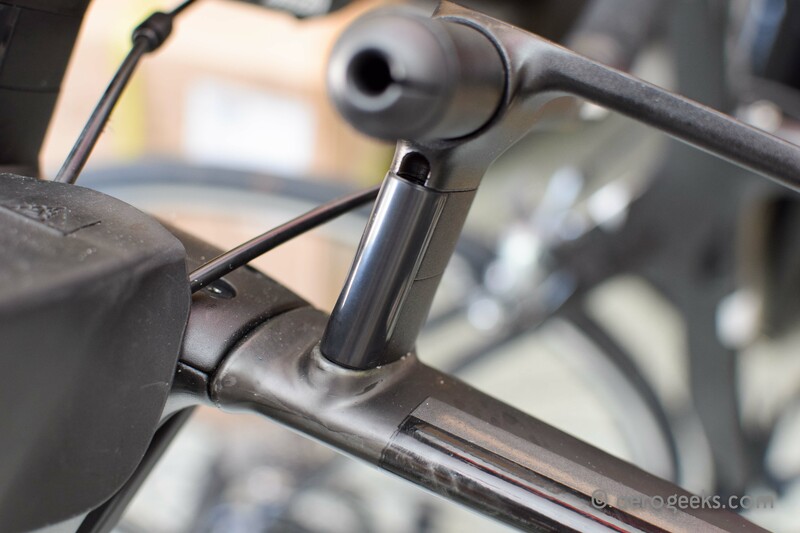 The TT stem stays in line with the top tube and allows for a very low position. However, the aero drink cannot be installed (which we recognize that those who have an ultra low position may not be happy with). The Tri stem increases handlebar stack by 45mm while maintaining reach and allowing for the installation of the aero drink. 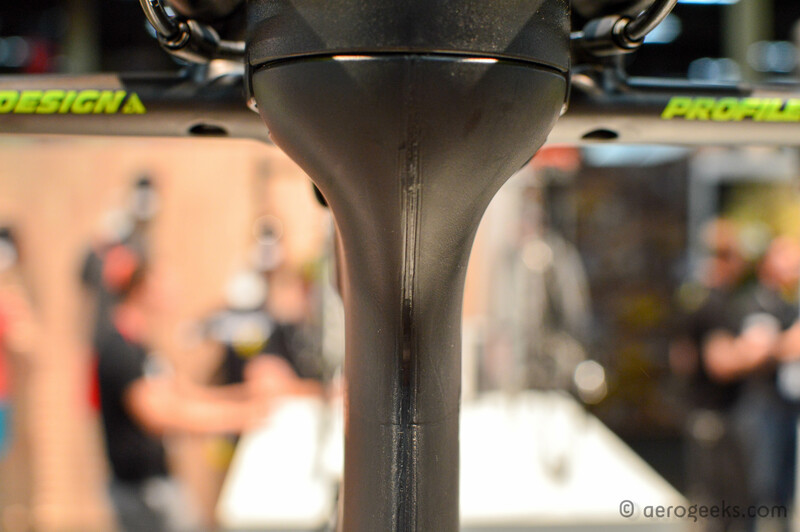 The new stems are 90g lighter than the previous Plasma 3 stem, yet the head tube torsional stiffness has increased by 47%. For your cockpit, the Plasma 5 features a modified Aeria that uses an ulti-flat clamping area (versus the standard 31.8mm clamping area). 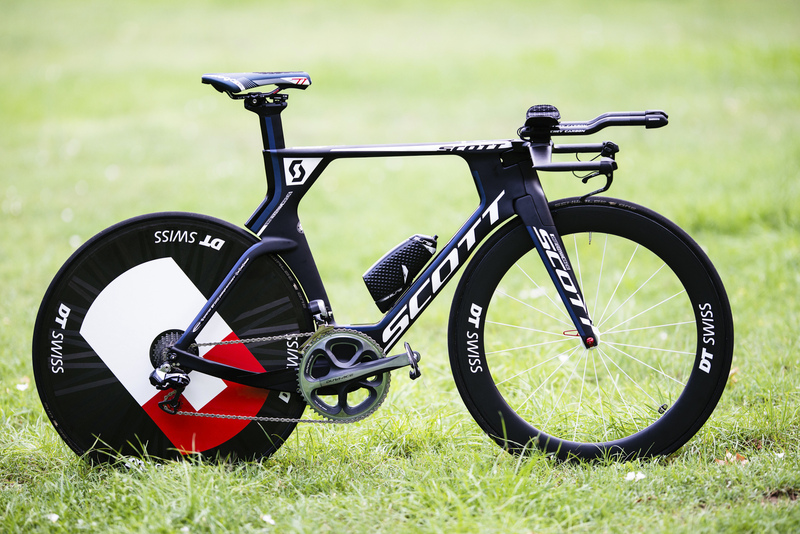 One of the biggest reasons that Scott went with the Aeria is the combination of aerodynamic performance and 3:1 UCI compliance (again bridging the needs of triathletes and TT riders). Scott offers three versions of the bar – a 420mm flat bar, a 420mm bar with 30mm of rise, and a 400mm bar with 30mm drop. The drop bar is designed for smaller sizes and very low handlebar positions. The rise bar is intended for riders with more upright riding positions. The spacers and extensions brackets allow for a rise up to 75mm. The extension clamping system is the based on the standard 22.2mm and can take either the included extensions or the new extensions shipped with the Plasma 5. 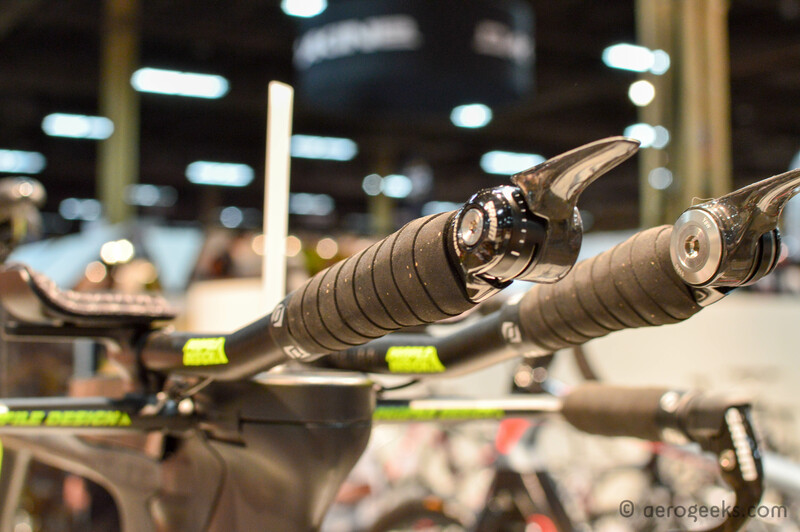 The new extensions were designed around the needs of Sebastian Kienle and bridge the gap between straight bars and ski tips. The pads feature a narrower mounting option and lower pad design. For those picky about their stopping power of choice, Scott has given you a choice: go with what they built or you can add your own. 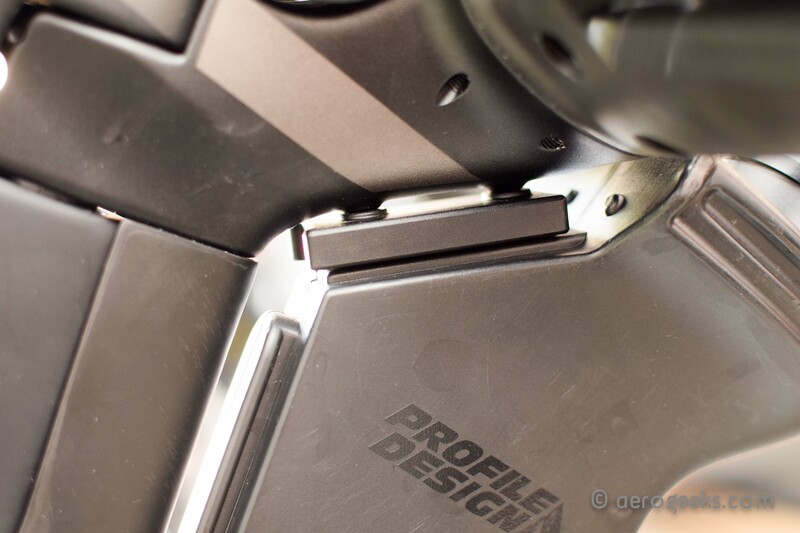 While the Plasma 5 ships with an integrated dual pivot / center pull brake, the frame can actually accept almost any brake currently available. The fork features mounts for both a Shimano Direct Mount interface as well as a standard brake interface. Have a preference for a TriRig Omega, Shimano 9K, or SRAM Red? All are an options (however, the brake cover cannot be used). The Plasma 5 is available in four sizes; Small through XL. 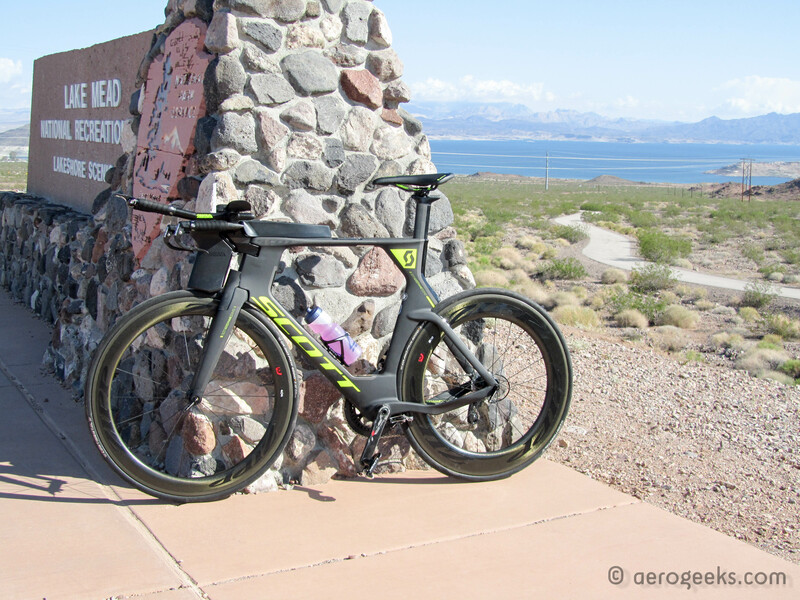 While we didn’t spend a great deal of time in the aerobars, we can tell you that this bike handles as one of the lightest aero frames we have tested. Climbing wasn’t quite up there with a Pinarello F8 or Fuji Transonic, but the Plasma 5 certainly didn’t make us feel as though we were carrying an elephant over a mountain. And after some actual quality time with the Plasma 5, our thoughts haven’t changed at all. Even with a full deep wheel setup (in our case we had on a pair of Flo 90 Carbon Clinchers) this bike accelerated as if it was a climbing bike in disguise. We spend an awful lot of time on our Trek Speed Concept, and while we do love that bike, we can tell you its not the lightest out there. While we have come to expect a bit more heft when it comes to TT and triathlon bikes, the Plasma 5 is the antithesis of that train of thought. It accelerates like a rocket, and when we had a chance to climb with it, it completely defied expectations. On the flats the Plasma 5 is an extremely capable cruiser. With the fairly large aerofoils you expect to feel the crosswinds, but even in extremely windy conditions it was more than manageable. You get the feeling that the Plasma 5 just wants you to pick a direction and it will do the rest. Something we found quite satisfying in a tri bike. Our biggest and really only nag with the bike was the front hydration – both for how it is set up, and then how you install it. 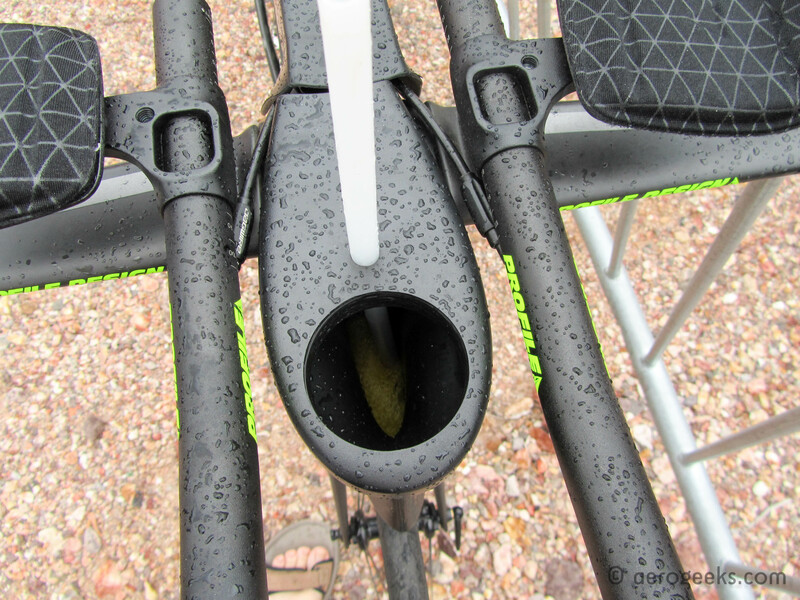 As mentioned above, the integrated bottle is mounted inline with the stem. This both results in a very clean bike (and aero shape) and a very, very long straw, at least for those who put any stack in their cockpit. Which unfortunately, we did. And the result is essentially that for every millimeter of space you add in stack, you need to add an equal millimeter of straw (and that’s just to get the straw above the arm rests). For those who are limited on how far over you can (or want to) bend to get your hydration, that’s even more straw you are going to end up needing. Considering the Plasma 5 ships with a hard straw, you could easily end up with over a foot of straw inside and outside the bottle, which honestly we found a bit disconcerting. We suspect a better option is to swap out with a soft straw and tether it to the bars above. The other issue with the hydration was getting it installed. As mentioned above, a soft interface fits between the bottle and frame. 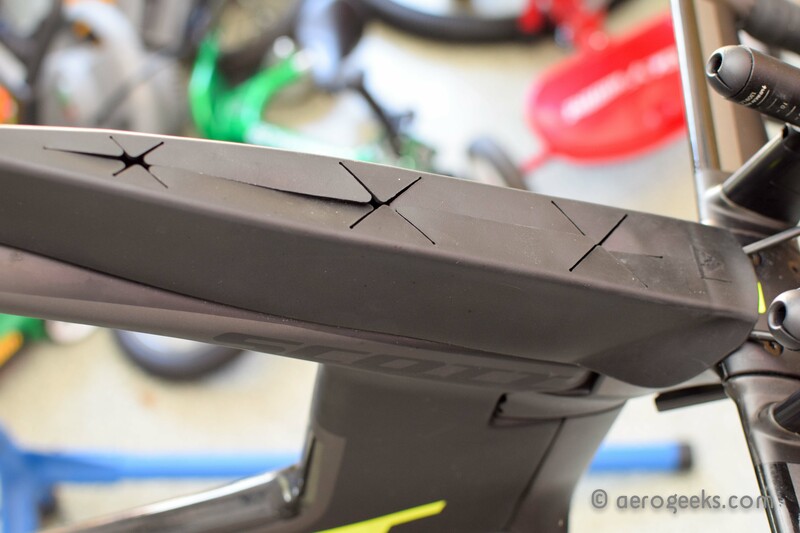 The benefit is both that the aerodynamic shape is kept as well as a reduction in vibration. The challenge is that getting the bottle installed with the three included rubber pieces that make up the “soft interface” is a pain in the a**. To the point that we seriously debated whether or not we really wanted to take it all apart to clean just because we knew putting it back together was going to result in a few four letter words being muttered. Every time we thought we had mastered installing the rubber parts, we quickly forgot the next install and had to relearn all over again. In the opening paragraph we called this one of our favorite bikes out there, and that’s one of the reasons it took us so long to complete this review. We really just didn’t want to give it back. Yes, the hydration was a PITA to get on an off, but honestly that was just a nag and something we learned to live with (and a soft straw would have solved our other complaint). We really just enjoyed riding this bike, plain and simple. We love a bike we can accelerate and have some fun with, and the Plasma 5 was exactly that. Considering our biggest complaint is that they made us send it back, that’s not really a complaint at all. 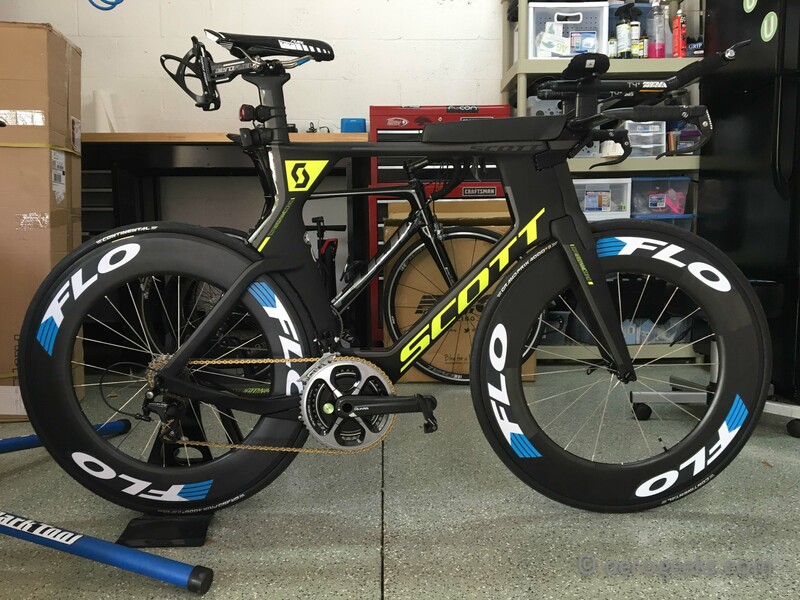 What size is the frame of the Scott Plasma in the pictures above?